Credit Score Range – Where Do You Fit In? So you know your credit score, now what? Brag to your friends? Compare it with your co-workers? Like all other scoring models, credit scores have numerical boundaries. The so-called “credit score range” for the standard consumer FICO score is 300 to 850, though other credit scores, such as the older and less popular VantageScore, start at a higher 501 and rise to 990. Before you go announcing your score to the world, get a better understanding of what that three-digit number actually means. In a nutshell, credit scores are risk scores utilized by lenders to determine the likelihood of you defaulting (missing a payment) on a credit obligation. How Risky Are You to the Creditor? The higher your credit score, the less risk you present to the lender. The lower your score, the more risk you present to the lender. By risk, I mean the chances of missing a payment, something lenders don’t like too much. As such, those with higher scores will have an easier time getting approved for credit cards and loans, and they will enjoy lower interest rates than those with low credit scores. I hope this illustrates how important credit scores are. A good one can save you money, a lot of it. Seriously, a higher credit score can equate to a lower interest rate on student loans, a personal loan, a mortgage, a credit card, and so on. But remember, to effectively evaluate your credit score you’ll need a range as well. Just as you would if you were taking a test in school, without one, a score is meaningless. After all, “A’s” and “F’s” would just be arbitrary letters if we didn’t assign them values beforehand. If you’re wondering how FICO came up with their unique credit score scale, as opposed to say 1-100, when the score was first developed the limits were not constrained, and 300 was the lowest score and 850 was the highest, based on their data and algorithm. However, some versions of the FICO score, such as those used for auto loans/leases, start from as low as 250 and climb as high as 900. And other FICO models have even stranger numbers that don’t seem to make any sense. Q: What is the range of a FICO score? A: While it’s true that there are numerous scoring models used by lenders, most versions of the widely used FICO score have a base range of 300 to 850, with higher scores representing less risk. 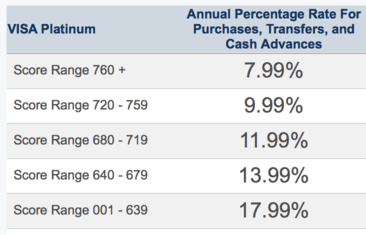 This is a recent FICO score of mine from American Express that is provided for free monthly. They apparently show customers the same scores they use in making credit decisions. It is the FICO Score 8 based on Experian data with a 300-850 range. They refer to my score as excellent, which is the highest credit score rating listed on their handy little credit score chart. And here is my credit score from Barclaycard, which is also FICO and ranges from 300-850. As you can see, they are very similar, despite being over a year apart in age. As long as you practice smart credit habits, your scores should remain excellent over time, even if there are times when you apply for several new credit cards, eventually close them, and repeat. The newly launched VantageScore 3.0 scoring model uses the same credit score range as FICO, 300 to 850. Look for the old scoring range to be phased out over time. FYI: Credit Karma uses VantageScore 3.0 provided by Equifax and TransUnion, FreeCreditScore.com uses the Experian PLUS Score, and Credit Sesame uses Experian’s National Equivalency Score, all of which are not true FICO scores. Wells Fargo uses the FICO Bankcard Score 2, which has a range from 250-900 and is tailored toward credit card issuers. For some reason, I always have a score in the mid-700s, despite scoring in the 800s for the traditional FICO score. It’s unclear why. And it really makes no sense because I rarely have a large outstanding balance, and always pay my credit card in full. The only thing I can think of is too many new credit card inquiries because I open and close credit cards fairly frequently, or at least more than the average consumer. In all, there are at least 30 different versions of FICO scores, spread across the three major credit bureaus, which include Equifax, Experian, and TransUnion. That means there are 10 versions per credit bureau, making it difficult to nail down exactly which range was used when your credit file was pulled by one of the reporting agencies. However, if you check out the fine print there should be something pertaining to the score range and type used so you can better determine where you stand. Check out the illustration I created of the standard consumer FICO score range at the top of the page, which is based on a median FICO score of around 710. This should give you a quick idea as to where you fit in, assuming you already know your credit score(s). 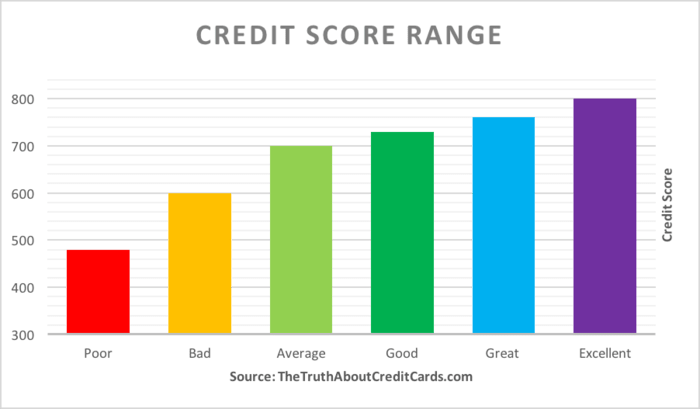 We also have an image of the FICO score distribution below, which illustrates where most consumers stand credit score-wise. Notice in the credit scoring chart that most consumers have an average FICO score within the 700-800+ realm. You’ll want to be on the higher side of this distribution to ensure you have good credit and are seen favorably by prospective creditors. In yet another illustration below from a credit union you can see how a certain credit score will affect the interest rate you receive on your credit card. So it’s important to maintain excellent credit not only to get approved for credit cards, but also to get the best terms and the lowest rates. Let’s start at the top (the best place to be in the credit scoring world) and work our way down. Note that we’re using the standard 300-850 FICO model for my credit score range, which is much more relied upon than any other algorithms at the moment. Q: What is a good credit rating? A: A credit score of 700 or higher is considered a good credit rating, though there are distinctions between scores above that level that can result in varying interest rates and approval rates. Regardless of the credit score model being used, remember that a higher credit score is better than a lower score! A credit score of 800-850 is basically flawless credit. Though I’ve never seen an 850 credit score (readers have told me they have 900+ scores but those are different scoring models), scores of 800 and up are fairly common. An important thing to note here is that some consumers may have 800 credit scores the minute their credit profile is established, but without supporting credit history, the score will mean very little to banks and mortgage lenders. On the other hand, a credit score of 800-850 accompanied by years of solid credit history indicates that the borrower will be granted the lowest rate on everything from credit cards to auto insurance and mortgages. Scores in this bracket represent about 13% of the population. Credit scores at this level are great, but they’re really no better than a 760 score. Most banks and credit card companies don’t give you any incentive past 760 in terms of approval rate or improved interest rate, so it’s merely for bragging rights. The only caveat is that you’ve got a buffer if your scores do drop in the future. A credit score of 760-799 is considered good to great credit, and will typically result in interest loan rates and approval rates that a credit score in the 800-850+ bucket would yield. The only difference might be a few more pricing incentives at the 800-850+ range, and a more thorough credit check. But all in all, credit scores in this bucket are considered excellent and you really don’t need to worry if you scores fall in this category. In fact, roughly 27% of the population has a credit score of 750-799 alone. Your credit score might be here because you’ve had one too many credit inquiries recently, not necessarily anything outright negative. It’s still an excellent credit score, and chances are payment history is perfect. *High Achievers: FICO now considers individuals with FICO scores above 785 to be in a bracket all their own. It’s unclear if this will create another meaningful scoring threshold for creditors, but I wouldn’t be surprised. A credit score in this range isn’t all that different from the 760-799 category, though there are some pricing thresholds for FICO scores of 760 and above. For example, when applying for a mortgage, a borrower with a 760 credit score may secure a slightly lower interest rate than a borrower with a 730 credit score. But it’s unlikely that the 760 credit score will be required for approval to buy a house. It simply leads to a more favorable interest rate, which means the more creditworthy borrower saves money! A 720 credit score may also result in better pricing for both student loans and mortgages, so if you’re just shy of 720, you may want to work to improve your credit scores ever so slightly so you can save some dough. If your score is at this level, it’s possible you had a late payment at some point, but it could just be that the type of credit you have isn’t diverse enough, or your credit history is just too limited. You can likely improve credit over time by continuing to pay bills on time, or simply lowering credit utilization. A score in this bracket is still considered good credit if at the higher end, and average credit if closer to the lower end. Although it’s not perfect, you should still be able to qualify for most loans and auto or rental leases, although interest rates may be a little higher than those offered to borrowers with excellent credit. There will be situations where a credit score in this range will prevent you from getting certain types of financing, such as an A-paper mortgage loan or the lowest auto insurance premium, but it’s certainly not bad credit. Some minor credit building might be all that you need to jump to the next highest tier. Scores at this level may signal higher credit risk, perhaps due to a maxed out credit limit or high credit utilization. It might also be possible that you need to work on building credit over time because it’s relatively new. Credit scores from 660-679 are considered “good enough” or “OK” by many creditors, though you may see further restrictions and fewer approvals when attempting to get a auto loan/lease, credit card, or a mortgage. Scores at this level are fairly common, and no cause for alarm, though they are below the average credit score. But it would be wise to evaluate your credit score and work to improve it. In this range, it is quite probable that you aren’t securing the lowest interest rates, and subsequently losing money as a result. For example, you may not qualify for all balance transfer credit cards, which can be a lifeline to those looking to reduce their interest rates and save money. It might make sense to sign-up for free credit monitoring to keep an eye on things and look for possible issues. If you find your credit score in this realm, you’re on the cusp of breaking bad. And you’re really playing with fire because a lot of creditors, especially mortgage lenders, see 620 as the dividing line between creditworthy borrowers and subprime borrowers. 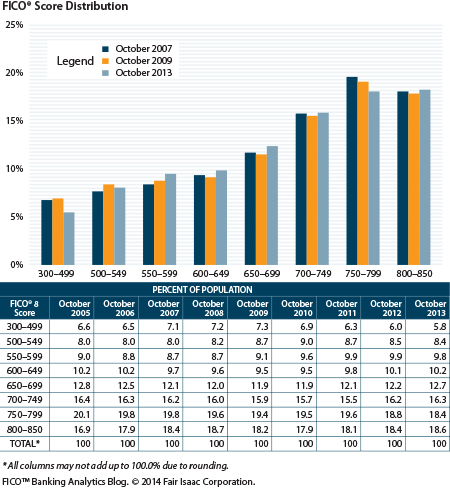 Additionally, some credit card issuers aren’t interested in extending credit to those with credit scores below 640. As such, you may be limited to credit cards for bad credit, which aren’t nearly as lucrative as the offers extended to good borrowers. You can probably kiss that awesome sign-up bonus goodbye if you have fair credit. At this level, you should probably be taking meaningful action to rectify the situation, as opposed to just casually monitoring your credit score. Although not the end of the world, your credit score is costing you money, and maybe even approvals on credit cards and other lines of credit. Expect mortgage rates to be higher, assuming you qualify for a home loan, and you might not even get approved for leading rewards credit cards or cash back credit cards. Car insurers may also charge you more! This is where “OK” and “decent” turn to “bad.” Credit scores in this range are clearly below average, and you will have a difficult time securing a loan, or applying for a credit card. If you are able to secure financing, you’ll likely be stuck with an above-market interest rate, especially for lower credit scores in this bracket. If your credit score falls in this area, you definitely need to take a hard look at your credit report and take measures to raise your credit score immediately. It might make sense to monitor your credit to determine if you’ve missed anything big, or to see if an error is reported in your credit file. Many consumers with credit scores in this bracket are considered “subprime” and may have to work with bad credit banks and lenders to obtain financing. In fact, you might be stuck applying for secured cards, which require a bank account for approval. You’re basically throwing money away at this point. If you find yourself at this point, building credit to offset the bad stuff can be difficult because fewer lenders will want to work with you. But that’s pretty much the best way to improve your situation. Scores at this level can make home buying more difficult, as not all lenders allow sub-620 FICO credit scores. Same goes for home equity loans, and refinance rates may be too high to justify. Credit scores in this poor credit bucket are just flat out ugly. If you’ve got a credit score in this vicinity, there’s a good chance you have a major derogatory mark on your credit report such as a collection, charge-off, mortgage late, a foreclosure, or a bankruptcy. There is no question that your credit score is in need of serious help. At this level, you must evaluate your credit and act immediately to turn things around. You’re clearly paying higher interest rates and making credit mistakes that will impact your life for years to come. And you won’t want to have to turn to less favorable financing options like a personal loan, which can be costly and contain unattractive terms. It’ll be more difficult to obtain any type of financing, from car loans to secured credit cards and everything in between. Credit scores below 500 are the worst of the worst. If your credit score is this low, your credit report will definitely contain numerous major credit problems, with very little positive data from the credit reporting agency to speak of. If your credit score is below this level, you may want to consider speaking with a professional about your situation. After all, there’s a good chance you’ve got serious financial problems if your credit score is this low. You may even want to see if identify theft occurred. Start picking apart your credit report line-by-line and educate yourself about credit scoring immediately to begin to alleviate your problems. It’s going to take time to improve your credit score, but not all hope is lost. Very few, if any, financial institutions will want to work with you, and you may need to be added as an authorized user to get any sort of new credit. This can make life really difficult, especially if you could benefit from something like debt consolidation. Full on credit repair services might be something to look at if you find yourself here. Some of the companies mentioned above that offer free credit scores (like Credit Karma) also offer some form of free identity theft protection. They might be worth looking into beyond the free credit checks they provide. And if that’s not good enough, professional help may be advised. The good news is that all credit missteps are fixable, some just take longer (and more work) to rectify. So now you should have a good idea as to where you stand credit score-wise and what you need to do to improve things, overhaul things, see a professional, or simply maintain your healthy financial lifestyle. Tip: Increasing your credit score can take time, so give yourself plenty of it if you plan to apply for a credit card or a loan in the near future.